Showcases ship knocked down to save on assembly and transport costs! Sliding rear doors allow easy access to merchandise! Anodized aluminum, melamine, & tempered glass construction is sturdy & affordable! These extra long, 6' black showcases can showcase anything from candy at a movie theater to ancient artifacts at a museum. 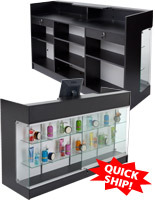 Are you opening a retail store and are looking for an attractive, yet affordable solution for displaying merchandise? Wary about gondola shelving because your merchandise is a bit too fragile to be handled by customers? 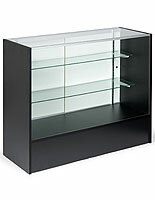 Afraid you won't be able to afford a complete set of counter showcases? You've come to the right place! 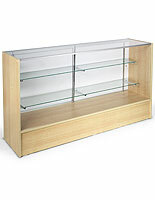 These showcases are perfect for anything you can dream of displaying! They are crafted from sturdy melamine panels to offer an affordable alternative to real wood cases. 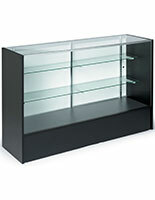 Tempered glass gives the showcases the durability to stand up to heavily-trafficked environments. 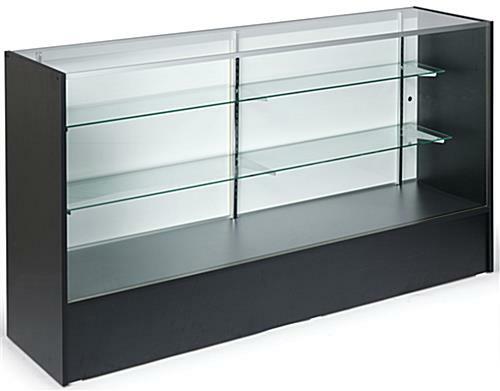 These showcases, also known as display cabinets, also feature fully adjustable tempered glass shelves to accommodate products of varying heights. Sliding hardboard doors provide retail sales associates easy access to displayed goods. Plastic feet are also included. 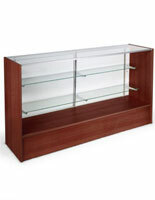 Showcases provide a centralized area to both store and display retail merchandise. They also form a natural barrier between customers and sales associates. 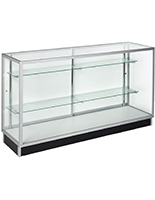 Display cabinets, showcases are crafted from tempered glass, which offers a safer alternative to traditional, annealed glass showcases. These showcases are shipped knocked down to save our customers hundreds! By assembling the showcases yourself, you save on warehouse assembly and shipping costs attached to the showcases! We have created an easy-to-follow video outlining the steps for 2-person assembly of the showcases. An added bonus to assembling showcases yourself is the shortened lead time. 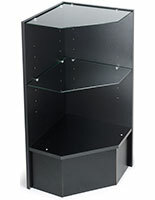 Order unassembled 6' black showcases before 1pm EST and they will ship out today!